No reason to mince words here; the Elite Force Expansion Pack is one of the weakest boxed add-ons I’ve ever played. There’s a decent idea here (along with the mandatory new maps for the soulless multiplayer), but they just didn’t do enough with the concept. It would have been a nice touch as an inclusion with the base game, but as a stand alone product, it’s mostly a waste of time. Take the warp core offline, and Torres will yell at you before immediately fixing it. Oh, that’s our Munro! Star of the show is the new “Virtual Voyager” mode. This appears as a standalone selection on the main menu, and takes you to a self-contained adventure within the halls of the title ship. As I said in my look at Elite Force, the replications of the shows sets were actually surprisingly effective, so it makes sense to open those up in a free-roam format. You’ll be able to visit ten ship decks with limited restrictions, and can visit landmarks like the bridge, astrometrics, Seven of Nine’s cargo bay, and engineering at your leisure. 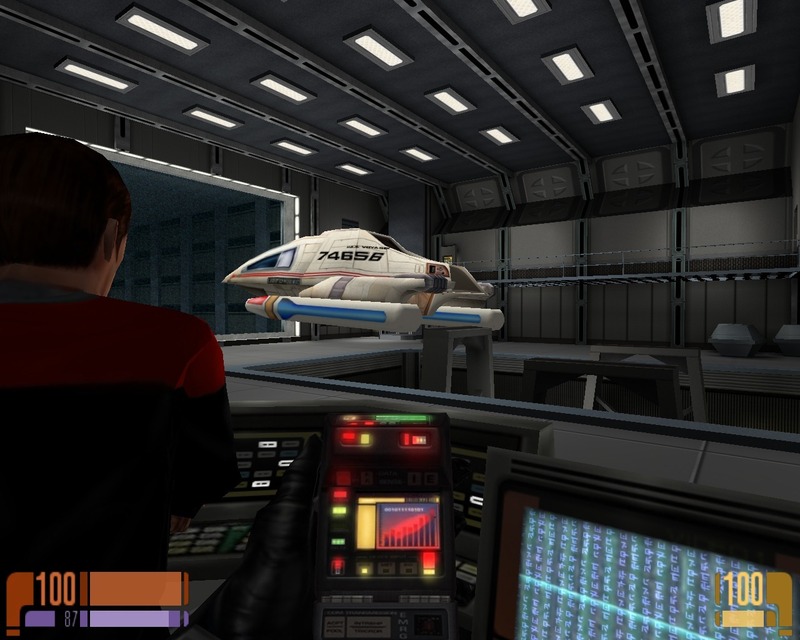 Virtual Voyager even contains its own set of challenges, which offer some basic, guided direction and crucial “things to do.” These include tasks like launching a shuttle, transporting cargo, and finding your way down to the lowest deck (15). Most will require some exploration and light puzzle solving to complete. There are also collectables – finding hidden weapons to complete your arsenal, one-off events, or all nine holographic Elite Force action figures (oh, yes) will check those tasks off on your mission screen. The problem is that every major location was already featured – in the entirety shown here – in the main game. They’re the same small slices of the decks as shown before, with the same “emergency force fields” in place to keep you from exploring more than a few hallways per deck. Even more annoyingly, there’s nothing new to do in the major areas. Engineering has the same functionality as when you were called upon to shut down the warp core. You launch the shuttle from the shuttle bay almost exactly as you did in the story. You still can’t do anything in Sickbay. Neelix just stares blankly at you in the mess hall. Fly, little shuttle! Fly free! Overall, there are scarce few buttons to press or panels to interact with, making wandering the ship less of a long-haul proposition, and more of a quick museum tour. I’m certainly not above exploring a fake starship (as I have proven before), but you’re given few reasons for doing so. Trigger Red Alert and Janeway yells at you. Trigger the Auto Destruct and the simulation reloads. Replicators in every room now actually dispense random food items, but that’s about the extent of the additions. You can’t interact with any members of the crew either, and not only that, everyone is surprisingly gruff to poor ol’ Munro if he tries to chat them up in the hallway. What has been added is a fairly substantial amount of text and computer logs. A library panel on the bridge lets you explore alien and weapon bios, and even a brief history of the Federation. A notepad in the briefing room lists the synopses of Tom Paris’ favorite Captain Proton episodes. Neelix’s kitchen computer contains recipes that I assume actually work (provided you replace Kalavian flour with just the regular old Earth kind). 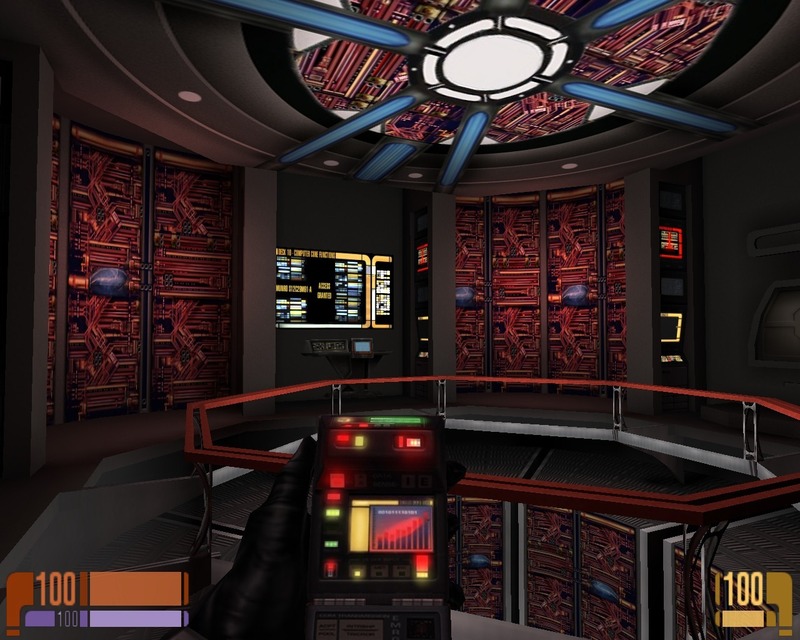 A new living quarters deck lets you see the cabins of all the crew and read a respectable amount of personal logs from during the events of Elite Force. If you want to read up on each character’s personal thoughts and sour opinions of Munro’s performance, well, someone spent a fair amount of time on diaries for just that purpose. Maddeningly, however, the mystery of Trek‘s bathrooms remain unsolved. Crew cabins show nary a toilet in sight. I think they must beam the poo right out of you. The new computer core area. Finally, there are three new missions on the Holodeck. These are self-contained challenges of a somewhat random nature – you’ll fight giant insects in a garden or blast through a Klingon outpost. 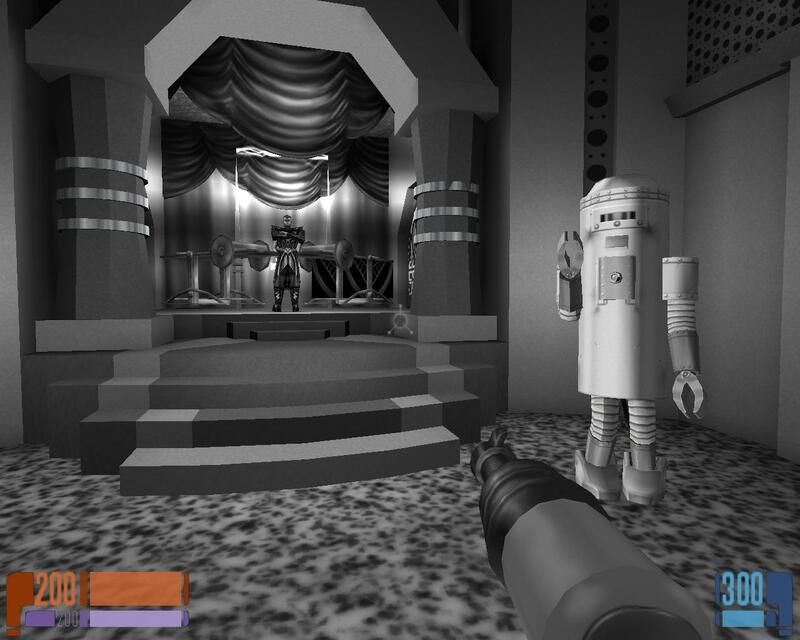 Most unique is a Captain Proton (the show’s nod to Buck Rogers) adventure that has you blasting through Dr. Chaotica’s fortress in glorious black and white. It’s a nice bit of fan service, though the level itself is bland. The last is a training room like the one from the story mode, except updated with an active leaderboard. Now you can out-shoot all the Voyager crew. 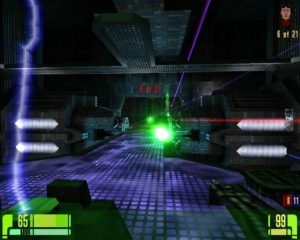 A final bonus game is found on Deck 15, which lets you play a brief top-down blaster against Borg drones in a short maze. 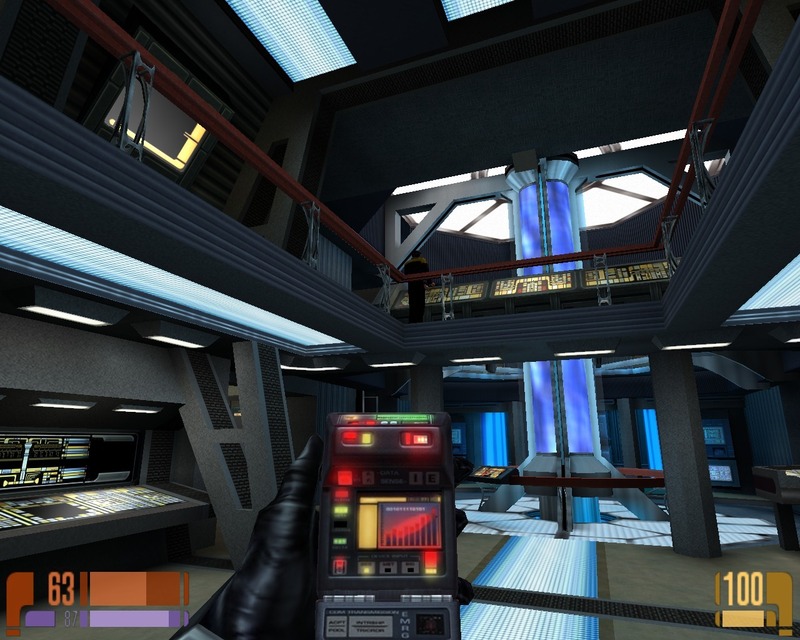 The Quake III engine apparently doesn’t allow you to holster weapons, so your default is now a harmless tricorder. It brings up pointless information about crew members (named after developers, I’m guessing) and some objects, and is otherwise non-functional. You’ll run around with it outstretched until you collect some proper weapons, after which you can shoot your fellow crewmates and end up in the brig for a while. If I haven’t made it clear yet, there’s really not a whole lot to do. There are no advancements graphically, and audio recycles clips from the main game. 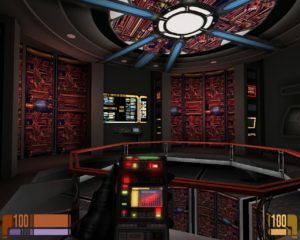 This version will update Elite Force to use Jeri Ryan’s dialogue instead of the Seven of Nine soundalike the game originally shipped with (Jeri was busy then, apparently), but there’s a free patch that does the same. Voyager still looks great, and the few new areas (the computer core, the crew cabins) all slot in seamlessly. The major setpieces (bridge, engineering, mess hall) also look as impressive as they did in the original game – though they also look exactly like they did in the original game. The only advantage is the freedom to visit them at any time. Assimilation mode lets you play as Borg. Multiplayer seems to be where the real value here lies, and the expansion brings forth 21 new maps for a total of 28. Five game modes are added, which the game accurately refers to as “parameters.” These include last man standing, one hit kill, and “action hero” (one player randomly gets a significant weapon and health boost) options, and can be added to any match in (nearly) any combination. The new “specialties” mode makes you pick a class with a default loadout, while removing pickups. The major addition here is a medic class with a hypospray that can heal others (the other classes just ration out the default arsenal). “Assimilation” is a team mode where one team plays Borg. Anyone killed by the Borg joins the Borg team (gets assimilated) with a new character model and two Borg-exclusive weapons. The other team wins by trying to kill the powerful Borg Queen. You can play any of these modes solo against computer bots, but they’re so brain dead that’s hardly a viable option. On a final note, the tour is a touch buggy. There’s only a single save available, updated either manually or on loading a new deck. Since you’re only saving progress, this normally shouldn’t be an issue. However, on one load I inadvertently spawned atop a NPC crewman in the turbolift and killed him. Killing anyone causes you to be thrown into the brig before loading your save – you guessed it – the very save created automatically upon killing the crewman. This put me in an endless loop and forced me to restart the tour, abandoning all previous progress. You’ve been warned. If this was just meant to be a multiplayer-focused expansion, then Virtual Voyager is a nice throw-in and a smart use of existing assets. But even if this was the intent (and who can say?) then it’s still a weak add-on for a limited slice of users. As far as I can tell, you don’t get a special bonus for completing all the tasks, and there’s very little to uncover anyway. I’m sure this was made by a limited team, and expecting more is probably asking too much, but it’s still barely worth your time. Voyager’s interesting enough to roam for an hour or so, but you’ll quickly wish more time had been spent on new areas, or giving you fun things to do. The hallowed halls of Voyager are still looking great. Tons of text logs to pour through, if you so desire. Letting you freely wander the ship is a smart enough idea. They basically just stitched together the areas made for the main game and added in some shallow collectables. Big focus on multiplayer, which won’t do you much good now. Nope, which is why there needs to be more to poke! I am on of the remains of the EF community and the funny thing is that yesterday we launched an event with the modi Capture the flag + Specialties, which was quiet fun actually. I totally agree on you regarding the SP part of the expansion pack. For me the only new cool stuff which has been introduced is “Borg Slayer” – the minigame you have already mentioned. It is a shame that the developer team did not come up with more ideas and made the ship truely walkable. The pickups are not on the map anymore, which is true, but some of them are still accessible. It only depends on which class you pick, each class has access to certain pickups. As Technician you can cloak a Sniper, which is really cool. In addition the Technician can’t use his more effective fire mode anymore (because it does a huge amount of damage and the shot also bounces from walls/floors –> you hardly “miss” someone actually). Anyway, i really enjoyed reading your review and it is pretty funny reading about this retro game while still playing it. Thanks for writing and clarifying! Didn’t spend enough time with it to know the nuances, so always helpful to hear from someone familiar with the game. Sounds like the expansion definitely makes multiplayer much more interesting than the base game. Best of luck with your tournament!